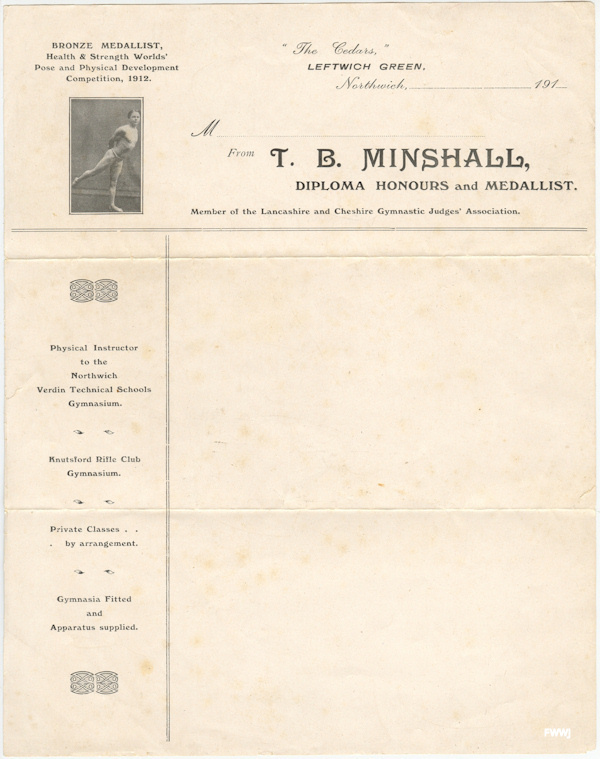 Thomas Minshall was a keen gymnast, and a member of the Verdin Technical School gymnastics team. He later became a physical instructor at the gymnasium, and was a member of the Lancashire and Cheshire Judges Association. name? - Thomas Minshall - name? - name? - name? name? - what trophy is this? - name? 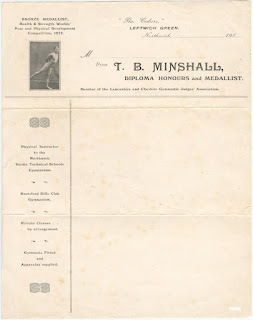 On a personal letter head Thomas identifies himself as a Bronze Medallist at the Health & Strength Worlds’ Pose and Physical Development Competition, of 1912. Can anyone provide any detail on this competition and where it was held? Mr. T.B. 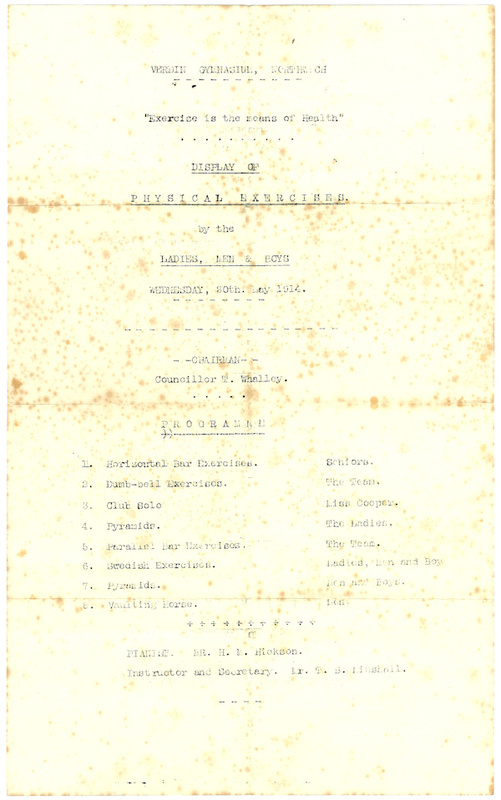 Minshall, the instructor and secretary of the Verdin Gymnasium, Northwich, is to be congratulated on the display of physical exercises given by the ladies, men and boys of the gymnasium on Wednesday evening. One might have expected a better attendance for such an event, but the weather was all against a large gathering. 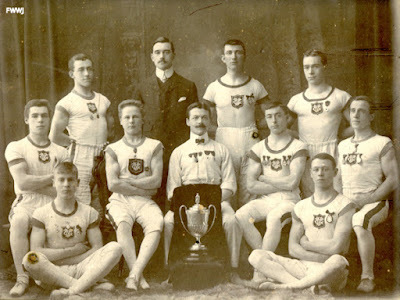 The number present, however, under such conditions, revealed the fact that plenty of interest is being taken in the work of the students of the gymnasium. The chair was occupied by Mr. T. Whalley. A varied and interesting programme had been arranged, the opening item being horizontal bar exercises by the seniors, which were very cleverly done. The dumb-bell exercises by the team were well timed, whilst Miss Cooper was responsible for club solo, which was splendidly performed and of which the audience showed their appreciation by a hearty round of applause. Pyramids by the ladies were most effective, whist the parallel bar exercises by the team were very good. There were also Swedish exercises by the ladies, men and boys, and vaulting horses horse by the men. Mr. H.M. Hickson made an able pianist. 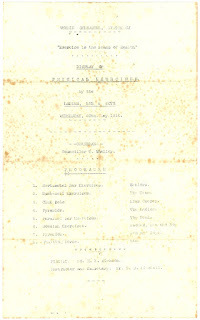 During the interval in the programme the Chairman said he was there, no doubt as the majority of them were aware as representing the Gymnasium Committee of the Urban Council, and that the display was held in order that thegeneral public might be able to see what work the students of the Gymnasium did and what benefit anyone who joined the classes was likely to derive from attending them, and he thought they could congratulate the instructor and all who had taken part in the display on the fact that it had been a very excellent one, both from a spectacular point of view and from the point of view of the physical benefit which would be derived and was derived by those attending the classes. There had been quite an array of fair women and brave men, and they had given them of their best. From remarks which he had heard, one or two of those who had taken part had been dissatisfied with some of the display, but he could assure them on behalf of all present that they had been quite satisfied. (Hear, hear). He had derived much pleasure from watching them and he hoped the result of that display would be that a great number of recruits would be added to the classes at the gymnasium. (Hear, hear). The wanted to see the classes patronised more thoroughly than they had been, and Mr. Minshall told them that the summer session was going to try to make it as interesting as possible. In addition to the exercise that had been carried on in the building he was going to do some outdoor work. (Hear, hear). There was one thing that he could not understand, that though there were classes for men and boys during the summer there were none for ladies. He did not know whether they got tired, but the fact remained there were none. (Laughter). To those who had come to that display he appealed to try to get others to join and get physical benefit from the instruction Mr. Minshall gave them. At the head of the programme they were told “Exercise is the means of health.” He did not know whether it was far fetched, but it was certainly one means. (Hear, hear). 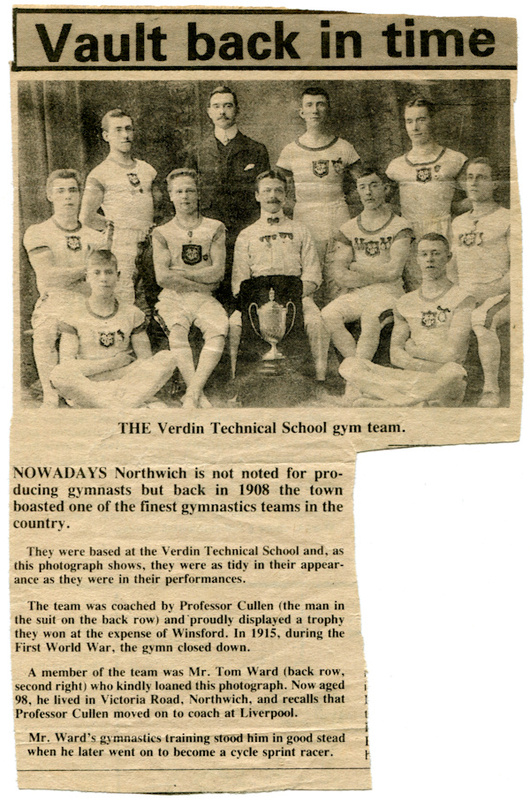 A copy of the Verdin Technical School gymnastics team portrait appeared in an unsourced Cheshire newspaper article probably in the early 1980s - the headline was 'Vault back in time'. It had been submitted by team member Tom Ward, who at the time of its publication was 98. Tom had lived in Victoria Road, Northwich, and later went on to become a cycle sprint racer. He recalled that Professor Cullen moved on to coach at Liverpool. The article also reported that in 1915 the gym closed down.